Hello, Jillian here and first of all Thank you to all who hopped with us on Saturday and continue to do so! You can enter to win the $100 prize pack I am giving away until Saturday, October 6th. Go HERE to enter and hop along! Lots of great projects and inspiration! 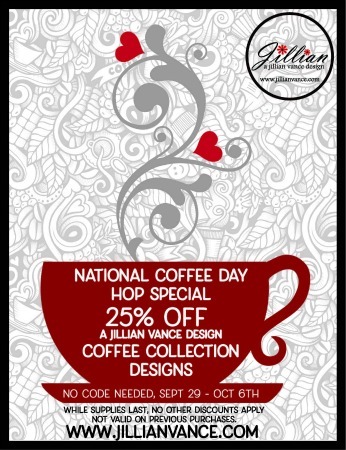 I am also having a sale on my Coffee Collection of stamps and dies, see graphic for details, no code needed! Well Happy October 1st! And with Fall brings also the month for Breast Cancer Awareness. We have had many friends affected by Breast Cancer, and I designed this set with them in mind. It coordinates so well with our Get Well Wishes which was also designed not only for illness but for ALL types of Cancer FIGHTERS and HEROES. You're all inspirations and you're in our thoughts and prayers every single day! 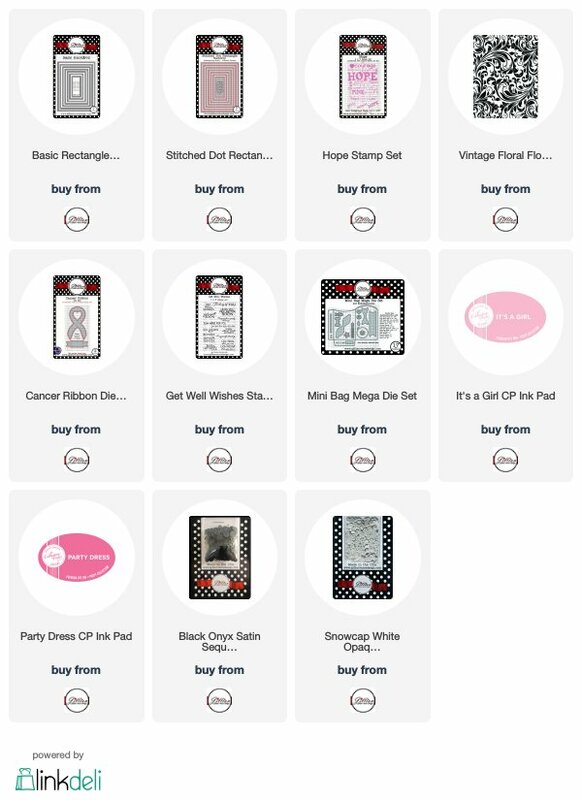 So mom and I created a couple cards using my Hope Collection of Stamps and Dies...including the Hope Background Stamp (a throwback from our INK Pin Collection in 2012) and the Cancer Ribbon Die Set, obviously not just for Breast Cancer. 10% from the sale of either set will be donated to the Vera Bradley Foundation for Breast Cancer! PLEASE get your mammograms, it has saved some of our friends lives! It's so important to keep an eye on yourself and your health, and I highly encourage not waiting to get a mammogram, or, if you feel something might be wrong, getting an examination; it's crucial! 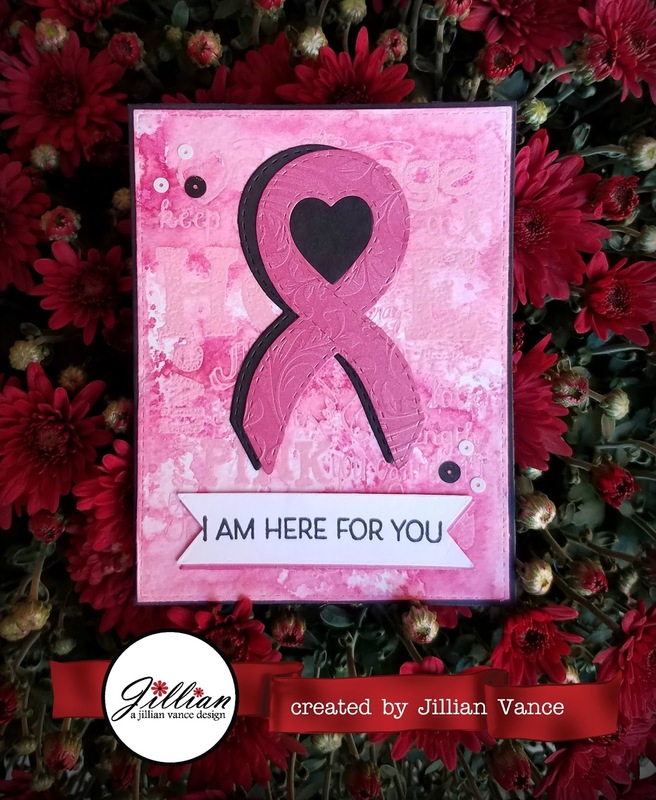 Please enjoy my card and see the A Jillian Vance Design products used below each one, we will also be doing a GIVEAWAY of Hope Background Stamp and the Cancer Ribbon Die Set, on the official AJVD blog! Head over HERE to enter. Please follow the Rafflecopter instructions...You must comment on this post and follow us on social media to be eligible to win! Have a wonderful week and make sure to get your mammograms and self-examine! Wishing you all the best for the week ahead.